This page contains an MP3 music player with my music. 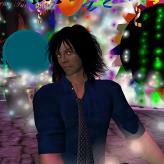 Most of the recordings come from recordings of shows performed in Second Life. http://itunes.apple.com/us/album/original-grif/id435177232?ign-mpt=uo%3D4 or here on the site.